The Police Commissioner, Ken Moroney, has said he will recommend to the Police Minister, John Watkins, that Taskforce Gain be given extra resources and made a permanent squad. The taskforce focuses on gangs in south-western Sydney with links to Middle Eastern organised crime. The proposed unit would have the same powers as the South-East Asia crime squad. It would include detectives and support staff including translators. The squad would reverse a decision by the former police commissioner, Peter Ryan, to shelve a proposal for such a unit because of fears it would be seen as racist. Senior police said the decision was short-sighted, ignoring early warnings that the city was facing a potential crime "time bomb" inside the Lebanese-Australian community. An alleged report in 2000 was said to have predicted problems that later arose. 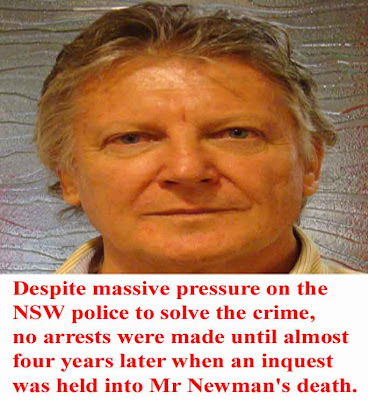 Despite massive pressure on the NSW police to solve the crime, no arrests were made until almost four years later when an inquest was held into Mr Newman's death. David Hardaker: John Newman drew public attention to the gangs. But his campaign only enhanced their reputation on the streets. And when Newman was killed, Tri Minh Tran and his gang were natural suspects. But according to his sister, the Newman name wasn't mentioned at home. The assistant commissioner of the New South Wales Police, Clive Small, responded to Detective Sergeant Tim Priest's comments a short time ago. CLIVE SMALL: Yes I do and I acknowledged that when I appeared before the parliamentary committee. CLIVE SMALL: It would seem to me that during 1999 and 2000 there were a number of internal problems at the police station and those problems meant that the fights in the police station were bigger than the fights on the street, if I can put it that way, and as a result of that the people of Cabramatta suffered. CLIVE SMALL: Look I think it was a bit of all of those things. Certainly there were management issues and a lot of those management issues revolved around whether or not the police sufficiently understood the problems on the street. JOHN STEWART: Do you accept the comment that over the past decade Cabramatta has become a major centre for heroin distribution, and that has impacted on other city and country areas throughout Australia? CLIVE SMALL: Yes and again publicly I've acknowledged and so has the service acknowledged that Cabramatta has really been the heroin capital of New South Wales and indeed Australia for some years. [One guess whom the people behind the people running the drugs in Cabramatta were? Starts with "G" and ends with "L" Come on you can guess that? No! Okay! What colour do the lights have to be when you can Go! Last May the violence spilled into public view, leaving six people dead and 13 injured. Small said yesterday he had presented his report, which drew on information gathered from five years of undercover police work, but would not comment on his conversation with Mr Ryan. One senior officer, who requested anonymity, said the decision had hurt Mr Ryan because it splintered support among his senior officers. "The Lebanese criminals have been a growing concern for more than 10 years and now every unit in state crime command is dealing with some form of major crime being committed by someone from the Lebanese community," the officer said. "It just makes sense to create a squad of specialists who are able to understand their way of crime and the way they do things." Instead of a permanent squad, there have been taskforces to investigate specific crimes associated with the Middle East-linked gangs. Although effective in small areas, strike forces such as Ranger, Benlow, Mask, Lancer and Operation Gore have been wound up. Mr Moroney said making Taskforce Gain permanent had always been an option since it was formed in October to target crime in the area bordered by Bankstown, Cabramatta, Fairfield, Flemington, Liverpool, Rose Hill, Ashfield, Burwood, Hurstville and St George. Taskforce Gain, headed by Detective Superintendent Bob Inkster, is also investigating the security industry, gun thefts and illicit gun supply, extortion, car rebirthing and drug crimes. "I'm enormously proud of the results already delivered by Bob Inkster," Mr Moroney said. THE DOG: Clive Small is Bob Carr's specialist hatchet man. These specialist squads go back to the old days like the old "hold up squad" who would bust down the door and blow you away without a witness unless the witness was another cop. The cops would claim you had a weapon and it was self-defence. Police are underwriting their own corruption in this State and the warlords who give the green light to criminals are changing the policies for Bob Carr. Why? Ask Bob Carr. The quicker Inspector Gadget gets out of Parliament House and on the dole, the better for all the good police who want to get on with the job of policing, according to the law. Don't accept the excuse for a new permanent taskforce according to Go Gadget! The body in the seven bags still hides its secrets Who is going to report this failure by the NSW police to solve this most important crime? When there is evidence that the perpetrator was the police who are the same people who are investigating the crime or said to be investigating the crime. The diversion here is that bikies committed the crime even though the head of Rebells bikie gang worked for the NSW police for 22 years in an elite tactical response group.